Wemark is a new startup that launched into stock photo industry recently and is currently building up their stock photo library, thus encouraging photographers to jump on board. It’s an innovative company using blockchain technology, with their own dedicated currency unit and smart contracts, to connect buyers and artists and simplify transactions. Their attractive point for contributors is the promise of higher (fairly high) royalty rates. But is it worthwhile to join? How does it work? How do you apply? Find the answers below! Currently online with alpha version, Wemark does not describes itself as a stock photo agency, rather like a better alternative to them. Their claim is to want to break with the stock photo agency business model that ultimately concentrates earnings, power and control in the companies, and diminishes the artists. They say they will do this by eliminating the “middleman” agent stock photo agencies are. Wemark is a digital content marketplace based on blockchain technology. 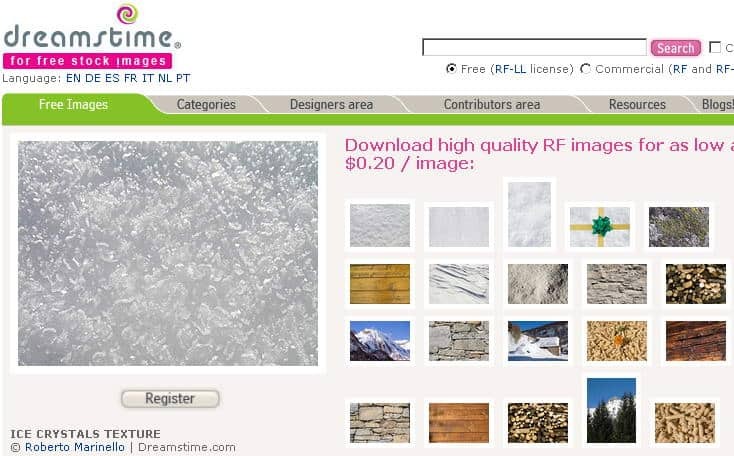 They will soon be selling stock photos using a native blockchain currency, using a blockchain protocol and smart contracts. They don’t want to be a middleman, but simply a transactions system provider. The core point in their offer for photographers is the high royalty rates. Higher than in most of the top stock photo sites. They can offer this because the simplified programmed protocol they will use in purchase orders will allow to reduce transaction fees by much, and so there’s more going to artist’s pocket. How much exactly? Transaction fee is set at 15% of sale price, leaving a considerable 85% in royalties to the contributor. This is certainly a lot more than the 25% to 30% earnings other main stock photo agencies pay out. Wemark’s online marketplace will launch in June 2018. For now they are accepting only stock photography contributions (but they plan to expand to illustrations, vectors, video and more later on). To become a contributor you need to sign up on their contributors page, complete your submission and wait for approval. Furthermore, you must be whitelisted for their upcoming native currency (Wemark Token – WMK) sale, which is already open and will run for 2 weeks. Wemark Tokens are priced at $0.20 each and there’s a limited supply. 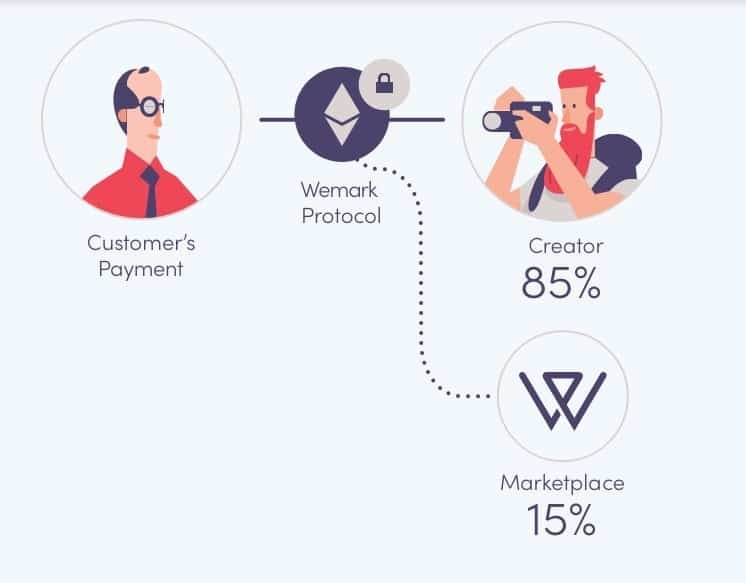 Buyers will need to get Wemark Tokens to buy photos, and you also need to be whitelisted in order to be a contributor, as the entire system is built on this currency. You can learn more about Wemark Tokens and enter whitelist here. Now you’re all set, if you’re interested in working with Wemark you can submit your portfolio here. See more details on Wemark for photographers here. Wemark promises their high royalty rates and efficient, artist-friendly approach will earn you between 2 and 4 times more than the top stock photo agencies. But of course, you need to sell in order to earn, and buyers need to find Wemark and your images if they’re going to buy. Their marketing line and company philosophy is strongly focused in photographers and artists, in the idea of fair trade policies and transparency. 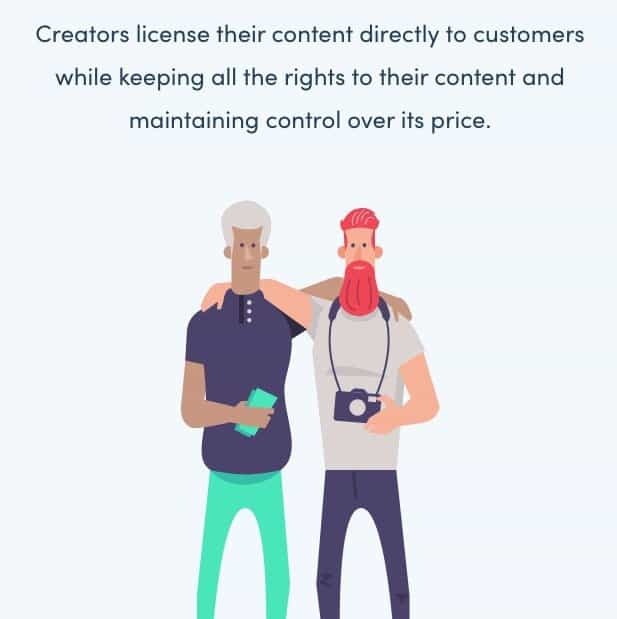 While it’s interesting that they are turning this philosophy into a tech-backed guarantee (the system is already programmed and can’t be altered), they are not the first company in promising a better way to sell photos and make more money. If the blockchain protocol is appealing to you, I have no doubt you’ll also like the perspective of a straight-forward system and higher revenue per image, so you might as well give it a shot. If buyers come, it could be a hit, or at least a decent earner. This is a very serious startup backed by venture capital, lead by two experts in digital marketing and software engineering respectively, both with over a decade of experience working with top brands and first-class companies. 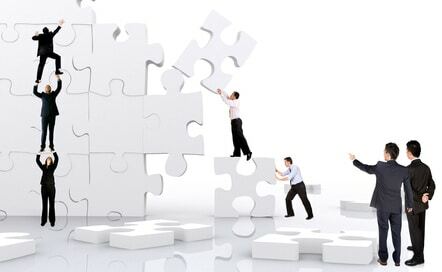 Moreover, they have renowned stock media industry experts in their advisor’s board. This includes Lars Perkins (founder of Picasa), Keren Sachs (former director of content development for Shutterstock), and Lee Torrens (marketplace director at Canva). They have a very clear business plan and roadmap, so yes, it’s a reliable company. If buyers will find it and adopt it, that’s another story, and only time will tell. So that’s the details. I think it’s an interesting idea, not short for innovation. Only the market will say if it becomes sustainable and successful or not, but if they do, it’s certainly a nice deal for photographers. But what do you think? Are you going to give Wemark a go? Submit your portfolio here and let us know how it goes! Top Cameras and Settings for Stock Photos - Cool Infographic by Depositphotos!